All buildings require some level of ventilation. Good ventilation create a comfortable working condition. Ventilation is not to be understood as air conditioning. Ventilation can best be represented by the number of times per hour the building air is replaced with outside air. This is referred to as air changes per hour. 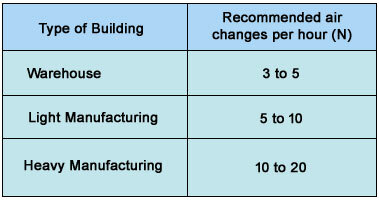 the number of recommended air changes per hour varies widely dpending on building use. The typical method of moving air in a building is by using wall openings and/or louvers. The typical method of moving air out of the building is by using roof monitors, roof mounted graviy ridge ventilation and roof mounted power ventilators. THe most economical method for moving air out of a building is by using gravity ridge ventilators. DPEB Steel's gravity ridge ventilators have a throatr opening of 600 mm and are supplied with a damper mechanism that can shut the throat opening during sendy storms. The exhaust capacity of DPEB Steel's standard 600 mm ventilators is listed in the table below with respect to the stack height (which is the average of eave height and ridge height) and the temperature difference ( C) between the inside and the outside of the building. The exhaust capacity value for 300 mm ventilators (that is used by other competitors in also shown for the sake of comparison. Our mission is to provide the best value and service to our clients. Here we are always ready to help you. We are devoted to the task to construct your dream to fit all your needs and preference. We realize that our success starts and ends with our employees so we try to provide excellent work to our clients with a level of expertise.